Navy Position: The OLF provides the best conditions for pilot training; no other location will be considered. The training conducted at NAS Whidbey Island, both at Ault Field and at OLF Coupeville, is critical for our naval aviators and enables their support of the Navy’s global mission. FCPLs are a highly complex flight exercise that trains pilots for landing on moving aircraft carriers. They are conducted on a runway that is designed to simulate the flight deck on an aircraft carrier. This exercise is conducted in a racetrack type pattern as closely resembling the pattern flown at sea to an actual carrier landing. 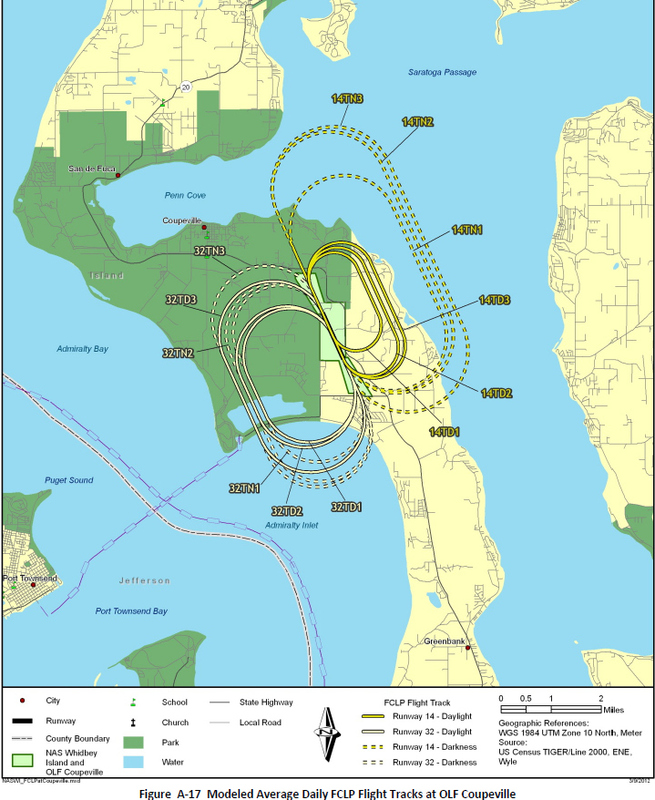 OLF Coupeville is ideal for conducting FLCPs as it is located in a relatively rural location. That characteristic is also critical for night-time landing practice as there is low ambient light, similar to what pilots experience at sea. Landing on an aircraft carrier is one of the most challenging tasks a pilot can perform, and it is a perishable skill that requires training just prior to each underway carrier embarkation. There are a number of reasons why the OLF Coupeville is not a suitable training location – for citizens, for pilots, for the Navy, and for national defense. Negative health impacts on citizens living below Growlers operations in Japan are the same as those in the U.S. The Navy may not acknowledge them, but the Japanese government does – and expects the Navy to pay 75% of the damages awarded to the citizens of Atsugi, Japan, in May, 2014. “The Japanese government must pay $70 million to residents living near Naval Air Facility Atsugi as compensation for noise created by aircraft at the base, a Yokohama District Court ruled Wednesday. The Navy must stop imposing comparable “serious health hazards” on the residents of Coupeville. US courts will not require it, so Congress must. Carriers turn to head into the wind when planes land. Pilots tilt up at full throttle and use any wind under the wings to help slow the plane down. They then stall to drop down. They do this at full throttle in case they don’t catch the arresting wires and must lift off again. It is amazing and extraordinarily difficult. Weather prevents many scheduled training sessions due to wind, fog, rain and lightening. Climate change predictions from the University of Washington indicate these conditions will increase. Fewer days and an increased number of planes will greatly increase the 24-hour noise impacts on residents. Population growth will clash with the ever-increasing need to develop VAQ capabilities. The Pacific Northwest is one of the fastest growing areas in the nation. A 1986 Navy study suggested the OLF be moved because of encroachment and provided an estimate of the cost. Over the past 27 years, the problem has dramatically worsened. Impossibly loud noise has combined with persecution – a very stressful, unhealthy combination. The Navy has seen the potential in expanded use of the Growlers which, because they will all be carrier-based, will require a dramatic increase in field carrier landing practice. In addition to the next 36 Growlers requested, the Navy has plans for more. More people, more planes flying over more homes in very limited space. The Navy’s decision to base all Growlers at NASWI jeopardizes the entire region when the health, safety, and quality of life should be a priority. The graphic below defines the preferred flight path for carrier landing practice at the OLF. It shows the low altitude plans fly on the approach to a carrier, a “pattern closely resembling the pattern flown at sea”. Since the lawsuit, on the approach to the OLF, they have been seen flying higher and dropping faster. Will this continue after the EIS? Variation from the pattern is not ideal for safe pilot practice and will probably not continue. Crash zones are designated in areas at either side of military runways, based on distance from touchdown and width. Look at the first graphic below to see how all of Admiral’s Cove is a the red crash zone as defined by these measurements. Click to enlarge. The area at either end of the runway is only designated as a crash zone if there are 5,000 operations per year. How can this be? If the limit is 6,120 operations, and there have been as many as 30,000 in the past (as there may be again), why has this area not been designated? The answer is that operations are divided over tracks. See the graphic below with several tracks, allowing the yearly number to be divided by each track over which planes fly. Despite these efforts to avoid designating crash zones, these areas do overlap where families currently live, right at the end of the clear zone, uninformed of the risk. Does carefully following these tight tracks simulate carrier approach? It seems to be another adjustment made to training because of encroachment around the field. Click to enlarge. It makes sense to put aircraft and pilots in a more remote location, where if an accident occurs, neither the public nor civilians will be adversely impacted and where there is ample room for the pilot to attempt to land the aircraft. 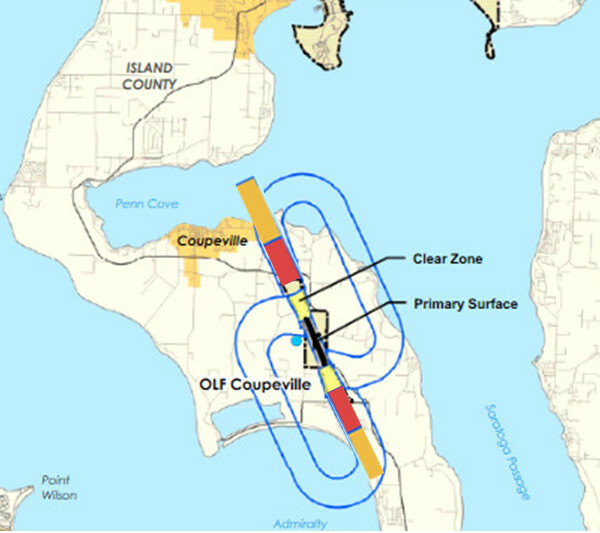 OLF, Coupeville does not provide this opportunity to land safely because (1) its runway is too short (the Navy had to get a waiver to use it); (2) encroachment of development and civilian homes has occurred in undesignated crash zones at both ends of the runway; (3) the major state highway is immediately adjacent to the field and crosses under the racetrack; (4) a new fuel storage area and transportation transit center are located in what amounts to the APZ 1; and (5) there is a mature second growth fir tree forest adjacent to the field in which one Prowler pilot crashed and died. The most dangerous and stressful aspects of flight training for both aircraft and pilots is takeoff and landings. Most serious accidents occur during this time. The path the Navy uses almost exclusively now (#32, intended to be used only 50% of the time) has the jets approaching directly over Admiral’s Cove at about 300 feet. This development is the most densely populated portion of either OLF path (14 or 32), and it lies in an undesignated APZ 1 zone. Given the Growlers poor safety record, the fact that it is now too late to constrain or reverse development, and the Navy’s conflicting needs for increasing FCLP training, the OLF safety issue must be addressed. Pilots need the best training possible. A new location for the OLF must be found that meets the needs of the pilots and does not inflict deadly noise on the families beneath their practice area. Because of the NEPA (National Environmental Protection Act) lawsuit and other encroachment issues, the OLF was not used at all for over 7 months, and usage since then has been adapted and reduced dramatically. The reasons for moving it are the same as those for adapting it’s use. The use of any NASWI OLF should be unrestrained – available for national defense and safe, closely simulated pilot practice. Is it true that if the OLF were moved, NASWI would close? This myth has fueled much of fear that creates animosity toward noise complainers. Whether or not the Navy has ever stated this literally, it is what many people in this community have come to believe. People feel their jobs and well-being are tied to the OLF and many understandably feel that job loss would effect the over-all economy. There are, of course, no jobs at the OLF. And, if the OLF were to fall into a sink hole, it is doubtful the Navy would or could close the base and move, instead of finding another alternative. In fact, they have found many other alternatives. For over the last year and more, all flights at the OLF were suspended for 7 months, and the use of the OLF was dramatically altered since. Another citizen speaks to the navy EIS comments….. Have you?